Johnson & Wales students decorated cakes interpreting an aspect of Charlotte. The cakes will be displayed in public libraries around the city. Johnson & Wales students decorated cakes interpreting an aspect of Charlotte. The cakes will be displayed in public libraries around the city. From left: Camryn McMeekin, Willow Bynum, Juli Wolfe, Sarah Tankersley and Mackenzie Root. Monday is Charlotte’s birthday. To mark the Town of Charlotte’s founding 250 years ago, local government and several groups are throwing a big party uptown — at the intersection of Trade and Try­on — and everyone’s invited. It’s part of a year-long look at Charlotte’s past, present and future. Like any good birthday celebration, there will be cake and lots of it. 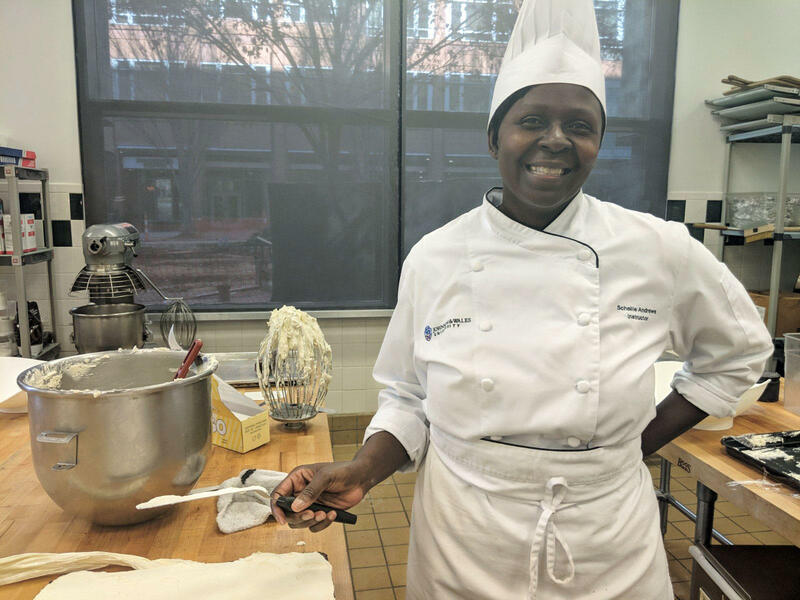 In a kitchen at Johnson & Wales University last week, Chef Schellie Andrews was dressed in chef’s whites and up to her elbows in icing. Chef Schellie Andrews is making 30 sheet cakes to feed 3,000 celebration-goers. She’s a baking and pastry instructor at Johnson & Wales. Andrews and a few student helpers were making enough cake, well, cakes — plural — to feed 3,000 people. They were making 30 sheet cakes, cutting each into 100 individual pieces for celebration-goers to enjoy. Andrews said they’re frosting each piece with the butter cream icing she’s been mixing up, chocolate sprinkles, rosettes and, if she has time, dogwood flowers, the state flower of North Carolina. Sarah Tankersley drew inspiration from Charlotte's art district NoDa for her cake. 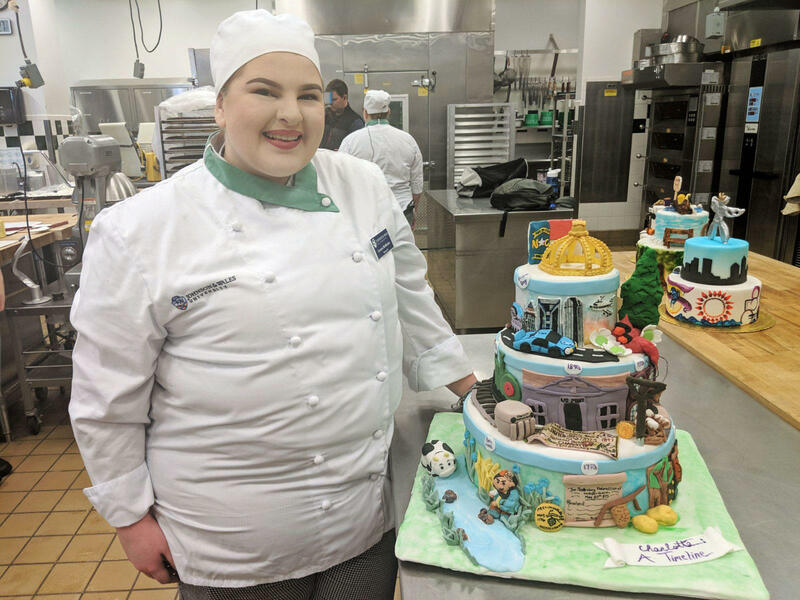 Andrews also gave her sophomore baking and pastry students an assignment for the 250th anniversary celebration: to make display cakes to practice their decorating skills. The theme? Interpreting an aspect of the Queen City. 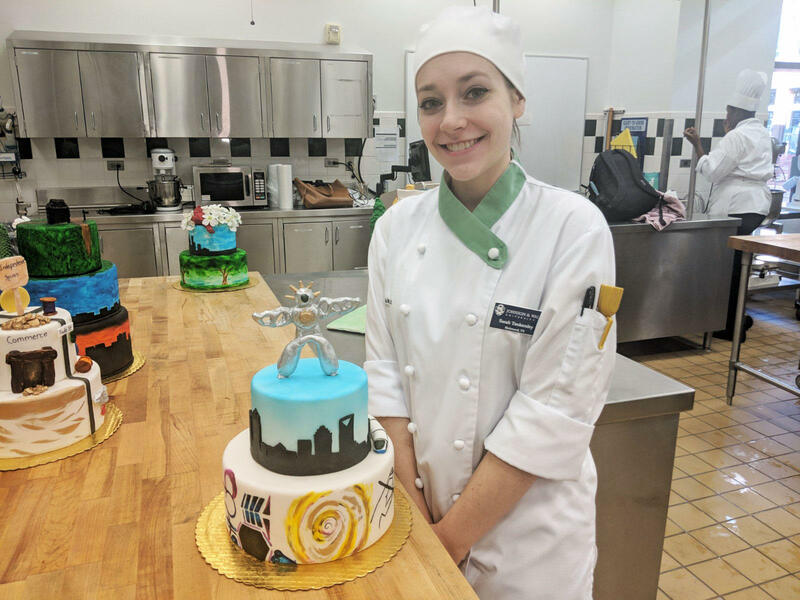 Sarah Tankersley, 20, drew inspiration for her cake from the Charlotte arts, specifically NoDa. 19-year-old Camryn McMeekin’s cake takes you through a timeline of Charlotte’s history. Camryn McMeekin depicted Charlotte's history on her display cake. Those two cakes and thirteen more will be displayed in public libraries around the city. Just a reminder: they’re not edible. They’re made out of cardboard and Styrofoam. If you want a piece of real cake, head to the celebration at Trade and Tryon between 11:30 a.m. and 1:30 p.m. Monday.